The famous hadeeth of the 73 sects is heard from both Shee`ahs and Sunnees in speeches all over the world. Well, here is a Hasan (Good) Hadeeth from Shee`ah books talking about the 73 sects, and about which one is going to the Heaven and which one is going to the Fire (i.e. Hell). From Aboo Khaalid Al-Kaabulee (Kankar) from Abee Ja`far (عليه السلام): He said: (asked about the words) «God tells a parable in which there is a company of quarrelsome people and only one of them is well disciplined. Can they be considered as equal? » (39:39). He (عليه السلام) said: «The quarrelsome ones» are because the first ones gather the different ones in his leadership and they did la`nah (curse) and did bara’a (disassociate) from each other. «The well disciplined man» is the first in the matters of his right as well as his Shee`ahs (followers). Then He (عليه السلام) said: “The Jews after Moosa (عليه السلام) separated into 71 sects of which one is in Jannah (i.e. Heaven) and the (remaining) 70 sects are in the fire (i.e. Hell). And the Christians after `Eesa (عليه السلام) separated into 72 sects of which one sect is in Jannah and the (remaining) 71 (sects) are in the fire. 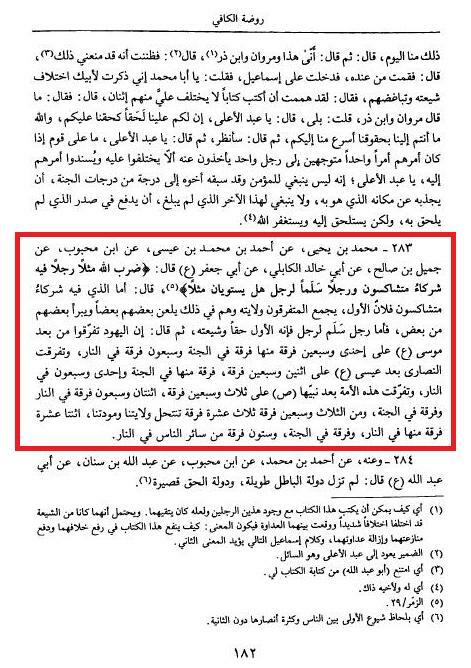 One of the narrators in the sanad is a guy who isn’t commonly found in other isnaads, his name is Aboo Khaalid Al-Kubaalee, it is said in Rijaal Al-Kashee from Al-FaDl bin Shaadhaan that he was one of the five people who were with `Alee bin Al-Hussayn (عليه السلام) since the beginning. (see: Rijaal Al-Kashee, pg. 115, hadeeth # 184). There are other aHaadeeth that praise him very much as well. Could you please elaborate on this part of the aforementioned hadith? He (عليه السلام) said: The quarrelsome ones are because the first ones gather the different ones in his leadership but they do la`nah (curse) and do bara’a (disassociate) from each other. The well disciplined man is the first in the matters of his right as well as his Shee`ahs (followers)." I fixed up the translation a little bit, but this is as literal as a translation as I can get without trying to interject my own opinions and using dhann (speculation). الرواية من المشهورات وقد رواها الفريقان مع اختلاف في النصوص وأقرب الروايات الى الرواية التي ذكرتها ما ذكره صاحب (الخصال ص585 ) ورويت بنحو آخر في (المعاني، والاحتجاج، والامالي، وكتاب سليم بن قيس ، وتفسير العياشي، والاحتجاج). يقول الشيخ جعفر السبحاني: ((وقد رواه من الشيعة الصدوق في خصاله... والعلامة المجلسي في بحاره ولعل هذا المقدار من النقل يكفي في صحة الاحتجاج به)) (بحوث في الملل والنحل ص26). ولقد اختلفت الآراء في صحة سند الحديث ((والذي يجبر ضعف السند هو تضافر نقله واستضافة روايته في كتب الفريقين: الشيعة والسنة بأسانيد مختلفة، ربما تجلب الاعتماد وتوجب ثقة الانسان به)) (الشيخ جعفر السبحاني في بحوث في الملل والنحل ص25). وقد ذكر السيد نعمة الله الجزائري في كتابه (نور البراهين ج1 ص60) ان الحديث متواتر فقال: ((... وهذا ينافي ما تواتر عنه (صلى الله عليه وآله وسلم) انه قال: (ستفترق امتي بعدي ثلاث وسبعين فرقة واحدة في الجنة والباقون في النار). على اختلاف قليل من نقل ألفاظ الخبر الا ان المعنى واحد)).